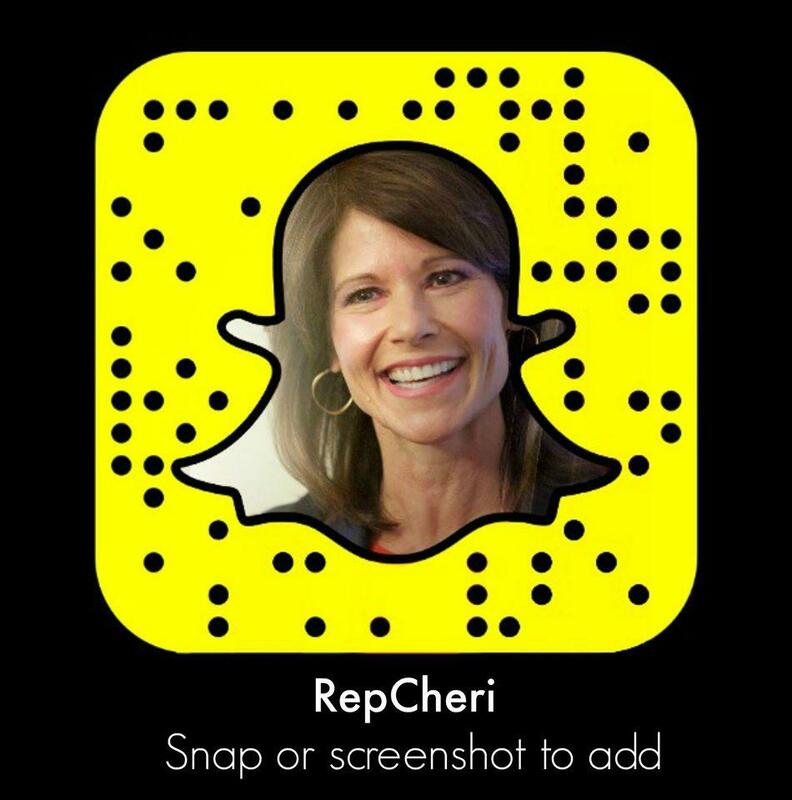 Washington- Last night, Congresswoman Cheri Bustos (D-IL) took to the House floor to speak on the Gold Star Spouses Leasing Relief Act, which passed with bipartisan support. 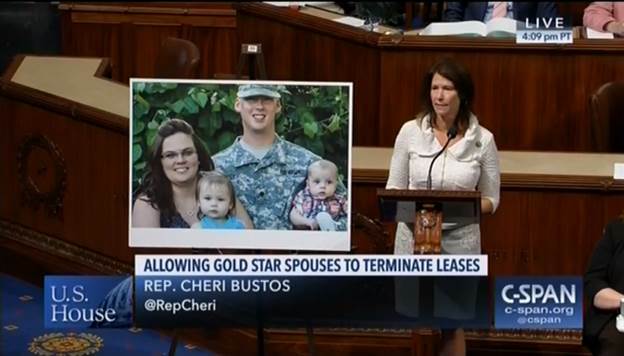 Congresswoman Bustos introduced this bill with Congressman Brad Wenstrup (R-OH), which allows surviving military spouses to break their leases without penalty in the aftermath of losing their spouse in service to our nation. This legislation was inspired by a Gold Star spouse, Kylie Riney of Fairview, Illinois. Kylie’s life was forever changed on October 18, 2016 when her husband, Sergeant Douglas J. Riney, tragically died defending our freedom in Kabul, Afghanistan. Kylie and her two young children, who were living in Texas due to Sgt. Riney’s assignment to Fort Hood prior to deployment, chose to move back to their home state of Illinois as they mourned their loss. While trying to make the best decision for her family, Kylie was confronted with costly lease cancelation fees due to a hole in the Servicemembers Civil Relief Act that fails to extend protections to Gold Star spouses. Bustos’ bill aims to fix that loophole to provide Gold Star families who have recently suffered a great tragedy. Last week, companion legislation was introduced in the Senate by Senators Elizabeth Warren (D-MA), Rob Portman (R-OH), Deb Fischer (R-NE), Bill Nelson (D-FL) and Doug Jones (D-AL). I rise today in support of my bill, H.R. 5882, the Gold Star Spouses Leasing Relief Act. This bipartisan bill would support the widows and widowers of our fallen heroes by allowing them to terminate residential leases without penalty in the wake of the servicemember’s death. This first came to my attention when I met a Gold Star spouse, Kylie Riney, of Farmington, Illinois, which is in a central part of the Congressional District that I serve. Kylie’s life was forever changed on October 19, 2016, when her husband, Sergeant Douglas Riney, tragically died defending our freedoms in Kabul, Afghanistan. Kylie and her two young children, James and Elea, were living in Texas at the time. This is their beautiful family, before tragedy hit. They had moved there when Sergeant Riney was assigned to Fort Hood before deploying in support of Operation Freedom’s Sentinel. After her husband’s death, Kylie chose to be back in Illinois with her family, surrounded by those she loves, and who love her, so they could mourn together this inconceivable loss. But in the wake of this tragedy, their landlord refused to allow Kylie to terminate the lease she and her husband had signed. It’s hard to even get those words out. The families of our fallen heroes have already sacrificed far too much. And we should do everything in our power to ensure grieving spouses receive the support that they need. For this reason, I was proud to introduce this common sense, bipartisan bill – the Gold Star Spouses Leasing Relief Act. And I want to thank my colleague, Congressman Brad Wenstrup, an Army Reserve officer himself, for introducing it with me. Currently, the Servicemembers Civil Relief Act protects servicemembers from lease termination fees when they deploy or receive a permanent change of station. Our legislation narrowly extends that law’s residential leasing protections to protect the surviving spouses of servicemembers who are killed while serving their country. I want to thank Ranking Member Walz for his work to help ensure this bill would protect all these families, including those who lose a member of the National Guard or Reserves. He has been a tireless advocate for the National Guard in Congress, and it’s a pleasure working with him. I can hardly think of anything worse than taking advantage of a grieving widow or widower whose spouse made the ultimate sacrifice for our country. I ask my colleagues to support this bill to ensure this does not happen again.